It was my great honour to meet you in Orlando in November. I couldn’t help hugging you! Thank you so much for all you are doing. 2. When you hand over the reigns of Socrates, please let this naive, gentle soul know how you will ensure its (super-) power will be used for good. You are incorruptible, but sadly, most are not. ANSWER: I do not believe that 2032 is the end of civilization. 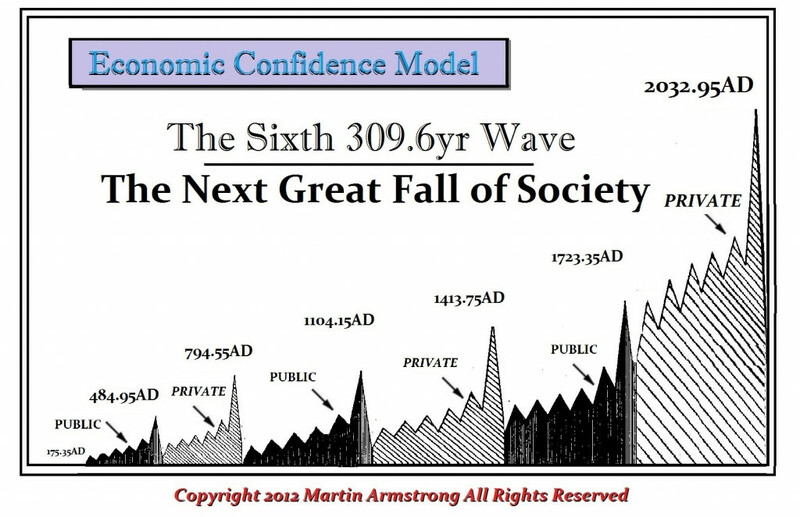 Even if we assume this Sixth Wave will be of equal importance as the one that picked the end of Rome in 175 AD. Roman society declined for the next 300 years, and then the Dark Age emerged for another 600 years. 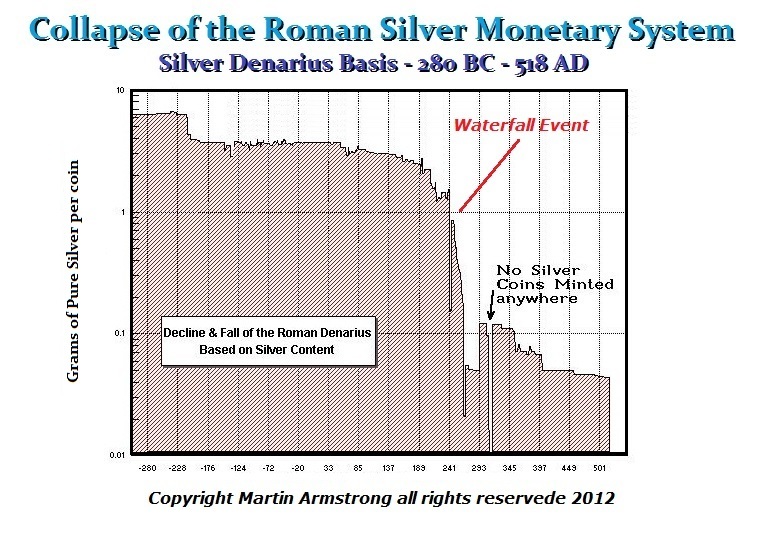 So from the actual peak in Roman society, the low was about 900 years later. That time frame is probably correct for North America but it does not mean society comes to an end. The financial capital of the world will shift to China, which will be the dominant economy for the subsequent 309.6-year period. Then it will migrate to Russia and then to Europe. It will probably take 900 years before it reappears in North America. None of that says you should hide in a bunker or wait for an asteroid to crash. Just look at the politics and how there is no longer a possibility of actually managing the government. The political in-fighting will render it incapable of government as was the case in Rome following 180 AD. Life will continue. Governments will be recognized by the vast majority as the major problem. That is already at 35%. The question will turn on how rapidly the monetary system will collapse. In the case of Rome, there was no public debt. The debasement unfolded as people hoarded coinage which then forced the state to reduce the silver content in order to meet the demand to fund the government. In our modern sense, we are on a debt-based system. The crisis this time will not be due to people simply hoarding, but from governments being unable to sell their debt to keep the government funded. This time, it will be different. 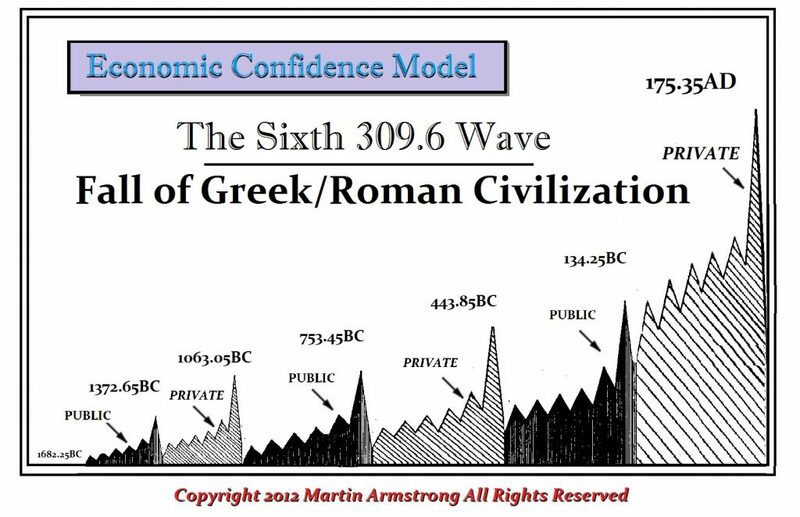 The modern economic system is LEVERAGED unlike that of Rome. Therefore, it will be prone to extreme sharp flash-crashes.